On the first day of the Brian Williams story, the USA Today "unmitigated disaster" report was atop my Google search. To many in the Twitter-sphere, the Williams on-air apology fell short, as it failed to explain the Iraq helicopter story exaggeration. It must have been a long weekend for NBC News executives. Their initial silence strategy failed to recognize that social media chatter would fill the void with #BrianWilliamsWarStories and #BrianWilliamsMisremembers memes. Strike one. Williams decision to take himself "off of my daily broadcast" but not the managing editor's desk raised more questions and social network conversation about what is going on inside the organization. Strike two. Whatever the insider accounts, outside in public view the UNO Social Media Lab and the Social Media Research Foundation continued to track significant negative sentiment across thousands of tweets. 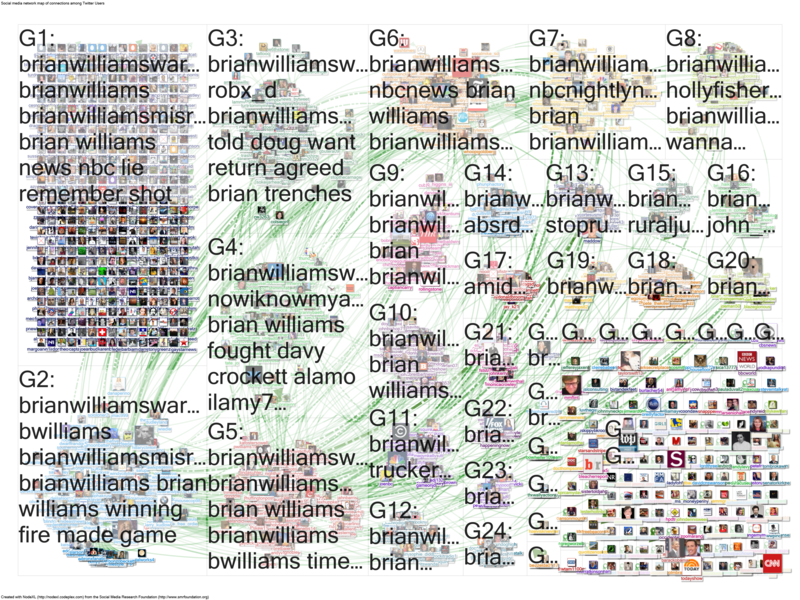 A graph of "Brian Williams" and related hashtags found that the dormant @BWilliams Twitter account was tagged along with NBC News, NBC Nightly News and other large media organizations. In other words, the negative sentiment building around Williams' personal brand spilled over to the network and newscast brands. 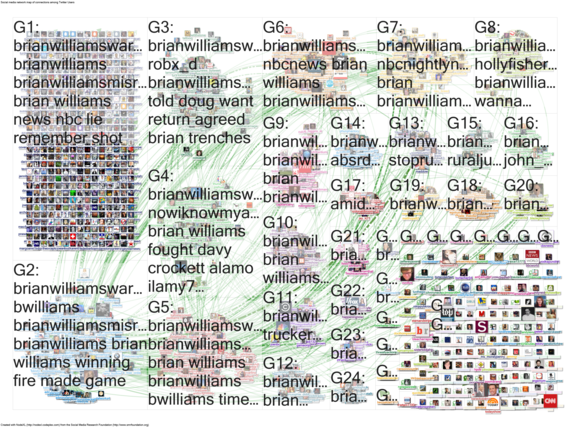 Among the top word pairs, according to a NodeXL Twitter graph analysis, were: hurricane and Katrina, Williams and fired, Brokaw and Brian, and Iraq and story. From a PR and branding perspective, there is very little for NBC to be happy about in the short term. There was some deflection of the serious controversy, as social media conversation inevitably turned to Williams' 2013 Jimmy Fallon "Slow Jam the News" appearance. Still, this also highlighted the continuing blur of news and entertainment that might generate fibs. As the new week begins, Jeff Greenfield's "LYIN' BRIAN?" piece in the Daily Beast takes the "Chopper Whopper" and extrapolates it to "modern news media." "His inaccurate, or misleading, or deeply dishonest account of what happened in Iraq seems to put the lie to a career that has featured him in the midst of one danger or another," Greenfield wrote. I am not ready to conclude, as some have, that the new media age offers a free pass on traditional media ethics and credibility. If anything, our social media age demands higher standards of transparency, authenticity and believability. Williams and NBC may have been listening to the uproar, but they missed numerous chances for social media engagement with the public. Business Credibility Social Media NBC News P.R.